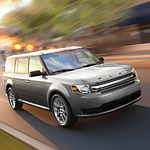 Comfort Features Of The Ford Flex | Donley Ford Lincoln of Mt. Vernon Inc.
One of the best comfort features of this vehicle are the second-row bucket seats. Not only are these seats ergonomically designs to form fit to your body, but there is also a pass through between them which allows you to easily access the third row of seating. This way, even an SUV full of adults is comfortable getting in and out. Additionally, drivers will love the ergonomic controls on the steering wheel. Almost any control within the vehicle will literally be at your fingertips thanks to the thoughtful design of Ford engineers.